A sweeping family saga spanning 1898 to 1984, stretching from the mining fields of South Wales to the film sets of Hollywood and from the playhouses of Cardiff to the grand theatres of Broadway – this new and far-reaching biography examines every detail and every facet of the life of Britain’s greatest ever actor, Richard Burton: how one extraordinary man had three fathers, three mothers, seven brothers, six sisters and four wives, and how he loved them all. And how that man earned US$75 million from the start of his career in 1951 to when he died in 1984; the equivalent of US$1.5 billion in today’s money, making him the highest-paid actor in Hollywood history. 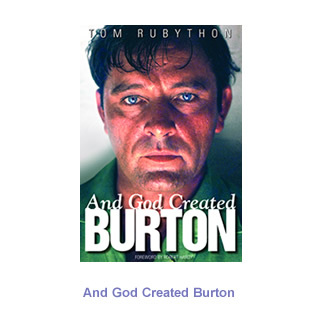 And God Created Burton is the first complete biography of the greatest Welshman ever to have lived. The man conquered Hollywood like no other British actor, before or since. His achievements were considered all the greater as they were accomplished in the era of such great British actors as Laurence Olivier and John Gielgud as well as great American stars such as Humphrey Bogart, Clark Gable and Cary Grant. Burton’s achievement was even more pronounced as his prowess uniquely spanned theatre, film and television unlike any other actor before him. In the end, he became a genuine legend in his own lifetime and in the mid-sixties, for one year, he stood at the very pinnacle of Hollywood as the world’s most bankable actor. He also loved and lost some the most beautiful and talented actresses of the era, including Elizabeth Taylor, Claire Bloom and Susan Strasberg. But he could have achieved even more if it had not been for his addiction to alcohol, a fate inherited from his father and which stayed with him right to the end of his days, eventually killing him and tarnishing an otherwise extraordinary career. Tom Rubython: Tom Rubython is a well known journalist and author, previously specialising in the twin worlds of business and sport. And God Created Burton is his debut book in the world of entertainment and the arts. Previously editor of well known business and sports magazines, he has scored twin success in books with the best selling biographies of racing drivers, Ayrton Senna and latterly James Hunt. The idea for the Richard Burton biography came from his research into Burton’s third wife who had previously been married to James Hunt. He believed that there was much more of a story to be told than had been previously. Robert Hardy: Robert Hardy was an original contemporary of Richard Burton right from the earliest days of his acting career at Oxford University to wartime service in the Royal Air Force to the earliest forays in London and Stratford-upon- Avon to his death. His big break came in 1959 appearing opposite Laurence Olivier in 1959 in Coriolanus in Stratford. It won him a major part in the TV series of the day, the BBC’s Troubleshooters in the late sixties. From then he didn’t look back and was never off television and the stage until he won the lead role in the BBC’s classic series All Creatures Great and Small in 1978. The series ran for 12 years. But for many his finest role was as Sir Winston Churchill in the Mini Series The Wilderness Years in 1981.